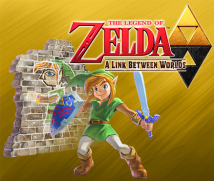 This game borrows the world of The Legend of Zelda: A Link to the Past, but it’s a completely new game. The subtitle in Japanese is Triforce of the Gods 2, but it’s a completely different game, so they aren’t using the “2” overseas. Overseas, the subtitle for the earlier game was A Link to the Past. Now it will be A Link Between Worlds. Yes. This time instead of “linking” to the past, the setting of the new game takes place far in the future, and the story passes between the two worlds of Hyrule and Lorule. So that’s why it’s called A Link Between Worlds. Right. In Japan, though, it didn’t feel out of place to add a “2” to Triforce of the Gods, so we decided on that. 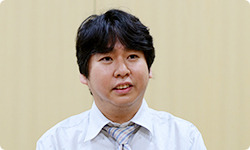 Some of the staff, however, thought that would encourage people to think it is a remake. But we use the game world of Hyrule and the top-down point of view. Because of those similarities, we decided on The Legend of Zelda: Triforce of the Gods 2 here in Japan. While there are those similarities, there’s the new system of becoming a mural. What else is new? I’ve worked on The Legend of Zelda for 15 years, and every time a new game is released, I hear opinions from my friends. It’s not a few people that get stuck somewhere as they’re playing and can’t get beyond that point. I feel like that is a big problem. If you get stuck on a dungeon somewhere, you can’t move forward. If you keep trying for a while but it’s no use, then you give up. Right. I knew not a few have that experience. Every time we make a new Zelda game, we always look for a different approach, and looked for a long time. When it was time to make this game, I had the vague idea that in A Link to the Past, you could clear multiple dungeons in parallel. But when I played the game again, that wasn’t very true. So I thought it would be good to do that for this game and we made it so that when it comes to the seven dungeons in the latter half, you can go to any of them as you like. Instead of a single order, you can take them in any order. Right. But that came with a number of problems. It would break down the structure of the games so far. Right. In Zelda games, you go into a dungeon, get a new item, and use that item to find the next new dungeon. That’s why there always ended up being a set order, but this time I worried over it for a long time, which brings us back to rethinking the conventions of Zelda. 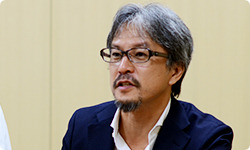 Aonuma-san, take over for me. Okay. (laughs) First, we talked about being able to buy all sorts of items in a shop. Then you could beat any dungeon. Yes. But when we talked about the prices, we realised cheap prices would allow players to easily get all the items, and then they wouldn’t need Rupees anymore. You’d never want to cut grass to gather Rupees. Right. But on the other hand, if we made the prices high, then you wouldn’t make any progress. So we wondered what to do, and what provided a hint was a certain hobby I’ve been obsessed with – but I won’t say exactly what it is. To play it, you need all kinds of equipment, and getting them all in the beginning is really hard. And it would be expensive. Right. But there are places where you can rent everything for beginners who don’t have the equipment. Then you feel like giving it a try. So I tried it once, and it was great! So then…(forcefully) you want it! You want your own gear!! I see. (laughs) Did you buy your own gear? I thought we could use that in this Zelda game. I thought if players started by renting items cheaply, then they would want their own and work hard to collect Rupees! Some have said they worked hard to collect Rupees but then didn’t have any way to use them. Then everyone had lots of ideas – like making personal items upgradable – so we decided to run with it. You choose whichever dungeon you like, you go in, and even if you get stuck, you can rent an item and go to conquer a different dungeon. Right. That kind of gameplay never existed before in the history of The Legend of Zelda.